Fartuun Adan is a passionate humanitarian, educator and leader. She fled Somalia in the early 1990’s with her 3 young daughters in tow, leaving her husband and partner to her humanitarian endeavours behind, never to see him alive again. She sought refuge in Canada for hopes of safer future for her daughters while her husband stayed behind in Somalia to continue their shared mission of protecting and promoting human rights. In 2006 Fartuun returned to Mogadishu to lead Elman Peace, a non-profit, non- governmental organization she founded in honor of her late husband, Elman Ali Ahmed; an ardent peace activist who spread the illustrious mantra “Drop the Gun and Pick up the Pen.” He was assassinated in 1996 for his work in disarming youth being forced to fight for warlords. Fartuun is the Executive Director of Elman Peace; the organization that under her visionary leadership has grown to nation wide coverage. She leads Elman Peace with values that promote human rights, a peaceful co-existence, and empowers women to have a full and equal participation in the processes that ensure their wellbeing. As the former chair of the Peace and Human Rights Network; an umbrella association of non-state actors such as NGO’s, Journalist Networks and individual Human Rights Defenders; Fartuun supported the members through capacity building, developing advocacy campaigns, and pooling resources effectively to spark national movements for peace and human rights. After serving two years as the Executive Chair of the network; Fartuun was nominated to be re-elected for another term, but declined; moving on to support the formation and strengthening of various aid coordination and civil society coalitions. Fartuun is a leading expert in the reintegration and rehabilitation of children involved with or disassociated from armed forces and groups. She is a valued source and partner for scores of researchers, donors, human rights organizations and journalists focused on the affairs of the Horn of Africa region. Under her leadership Elman Peace has become a leading organization in Somalia on matters related to Peace and Security, Women’s Political Participation, Education, Ending Violence Against Women and Girls and Policy Change. Fartuun is a lobbying partner of Oxfam, Amnesty International, and Human Rights Watch among others. Since 2009, she has been the only civil society representative from Somalia to attend the Universal Periodic Review of Human Rights in Geneva. Fartuun is also a founding member of the International Commission on Violence Against Women and Girls, an international working group to develop a global treaty on violence against women. Fartuun also has been the Somalia coordinator for V-Day, a global movement to end violence against women and girls since 2012. 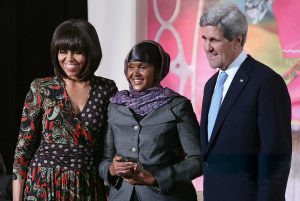 On International Women’s Day, March 8th 2013; Fartuun was honoured with the International Woman of Courage Award by Former First Lady of the United States of America; Michelle Obama and Secretary of State, John Kerry. In December of 2014 she was also honoured with the Human Rights Award for her dedication to protecting human rights in Somalia with special focus on women's rights by the Friedrich Ebert Foundation (FES). In 2015 she received the Gleitsman International Activist Award from Harvard University, the 2016 Right the Wrongs Award from Oxfam America and the finalist award in 2017 from the Aurora Prize Awakening of Humanity. As Executive Director of EPHRC, Fartuun has been key in propelling global attention towards Somalia’s sexual and gender based violence epidemic; with notable success in influencing policy change, empowering Somali Civil Society organizations and developing eminent relations with National and International State actors in Somalia to prevent the impunity in which human rights are violated. Fartuun has supported the development of National strategies that have been adopted by the government of Somalia all while ensuring communities are at the heart of these processes.